The Telangana government on asked for the help of National Disaster Management Relief (NDRF) on Thursday for rescue operations in Hyderabad as the city was battered by heavy rainfall in the last 24 hours due to active south-west monsoon. 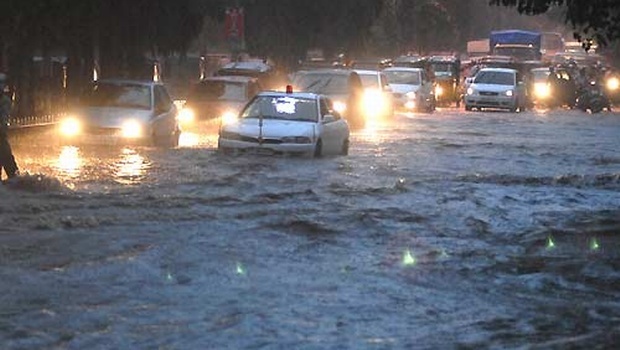 The rainfall in Hyderabad is the worst hit as normal life was struggled due to heavy rains. The city has witnessed about 164 mm of rainfall during the last 24 hours. Telangana CM K. Chandrashekar Rao instructed officials to take all precautionary measures in view of the heavy rain forecast for the next 48 hours. Indian Meteorological Department (IMD) in its mid-day bulletin warned for further heavy rains as south-west monsoon is strenuous over Telangana along with Konkan region of Maharashtra and Goa. Telangana has received 120% excess normal rainfall so far in September. The rainfall in September stood at 217.2 mm and for the current year it was around 767.2 mm. South-west rainfall brought inspires the farmer of south Telangana, which is swerve under severe drought situation till August. Telangana received 42% deficit rainfall in August, and was staring at a third consecutive year of drought, and farmers were losing hope on summer crop or Kharif. Telangana for 2015-16 received 592 mm of rainfall, which is much below its normal forecast.